What does adrenal fatigue really mean? What causes it? And is there actually a cure? These are just some of the questions we’re answering today with the author of the New York Times bestselling book The Adrenal Reset Diet, Dr. Alan Christianson. Dr. C knows about adrenal issues at a far deeper level than most. Being the accomplished endocrinologist that he is, that’s one thing. But being someone who’s overcome devastating health issues himself, puts him in a league of his own. You’re going to uncover piece-by-piece how your incredible endocrine system works to keep you fit, energized, and healthy. It’s these connective pieces that can bring you game-changing results in how you feel in just a matter of days. Adrenal fatigue is a hot illness right now, but it’s time that we kick it off the runway and let radiant health strut its stuff. Click play, take good notes, and enjoy! How struggles with severe childhood illnesses led Dr. Christianson into the field of medicine. What your endocrine system actually encompasses. Where the CEO of your endocrine system is located. Why our thyroids are more susceptible to disease today. The potential downside of iodine for your thyroid (this is important!). How the pancreas is involved in maintaining metabolic rate. How your liver influences your blood sugar (far beyond the foods you eat!). Why mathematical models for human health are not always accurate. Why we might want to be a little more cautious about ketogenic diets. What role your adrenal glands play in ketosis. The critical functions cortisol is responsible for. Surprising facts about your adrenal glands. 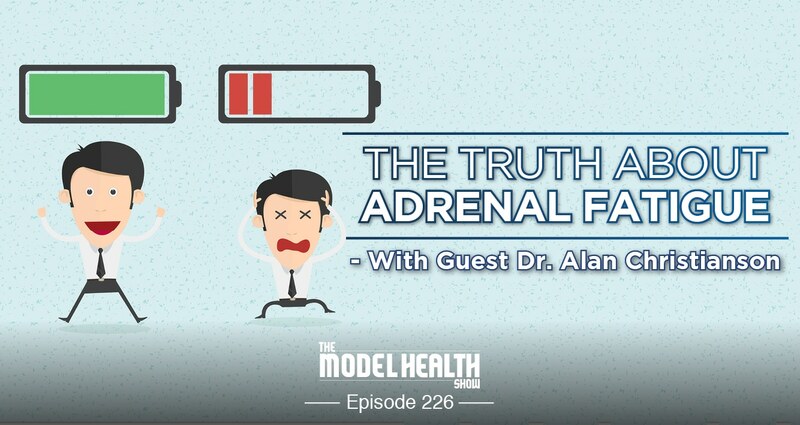 The truth about adrenal fatigue and why it’s not exactly what the name implies. How cortisol influences your sleep patterns. The practical steps you can use to reverse perceived adrenal issues. The ideal time to eat carbs to support adrenal health. Why resistant starch might be a crucial part of your diet. Discovered your podcast a couple months ago and currently working listening to the old catalog and keeping up with the current episodes. Love all the information that you and your guests provide! I’ve done alot of research myself lately on heartburn and gastro topics as I have been a chronic sufferer of heartburn for 4 years and have had esophagus ulcers and been diagnosed w/ Barret’s esophagus and I’m only 28. Did discover a few of your older episodes about gastrointestinal health which were great. I’m in the process of learning how to take care of myself better and trying to get off the proton pump inhibitors that have been prescribed to me. I haven’t made it through all your old episodes yet so not sure if you have covered this before, but do you have any resources for healthy eating? I’ve grown up learning how to cook and eat alot of home cooked meals but its a pretty typical diet, mostly meat, a little vegetables/salad and fruit. I’m trying to learn how to incorporate mostly vegetables in my cooking but as someone who isn’t used to this, it seems hard to find information, recipes etc. Thanks again for all the great info!